Y = pulsint(X) performs video (noncoherent) integration of the pulses in X and returns the integrated output in Y. Each column of X is one pulse. Y = pulsint(X,METHOD) performs pulse integration using the specified method. METHOD is 'coherent' or 'noncoherent'. Pulse input data. Each column of X is one pulse. Pulse integration method. METHOD is the method used to integrate the pulses in the columns of X. Valid values of METHOD are 'coherent' and 'noncoherent'. The values are not case sensitive. Integrated pulse. Y is an N-by-1 column vector where N is the number of rows in the input X.
Noncoherently integrate 10 pulses of a sinusoid with added gaussian white noise. 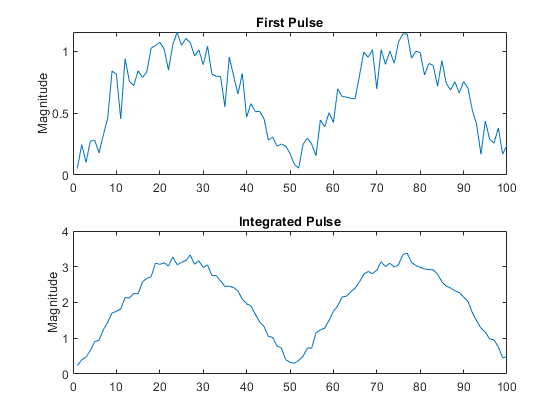 Plot a single pulse and then the integrated pulses. Let Xij denote the (i,j)-th entry of an M-by-N matrix of pulses X.